Leaf stomata are the principal means of gas exchange in vascular plants. Stomata are small pores, typically on the undersides of leaves, that are opened or closed under the control of a pair of banana-shaped cells called guard cells. 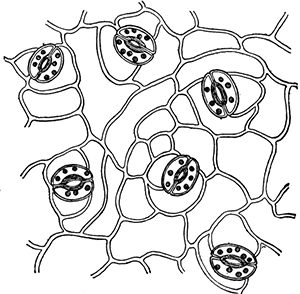 When open, stomata allow CO2 to enter the leaf, and allow for water and oxygen to escape. In addition to opening and closing the stomata, plants may exert control over their gas exchange rates by varying stomata density in new leaves when they are produced (such as in the spring or summer). The more stomata per unit area is the stomata density. Why might it be adaptive for a plant to control its rates of water loss and CO2 uptake? One answer can be found in the sun. Increases in heat could denature proteins of membranes of chloroplasts. When overheated, plants may open the stomata to evaporate water to lower the temperature. Based on this, you could hypothesize that leaves in the sun would have a higher stomata density than leaves in the shade. On the other hand, if water is not available, such as under drought conditions, excessive evaporation might lead to desiccation (drying out.) Plants in hot areas may benefit from fewer stomata so that they can conserve water. The discussion illustrates an important concept in experimental biology, that there are often alternative hypotheses to explain variation in nature. In this case, the stomata density may increase or decrease in response to environmental variation in sunlight and water availability. 1. What role do stomata play in homeostasis? 2. Two hypothesis for stomata density are described. How could you test them? 3. Plant species might have variation in the number of stomata present on their leaves. Why? 4. Plants move waters from the roots of the plant to the leaves through transpiration. As water evaporates from the leaf, cohesion pulls water up from the roots. Suggest a relationship between transpiration and stomata density. 1. Obtain a leaf. Trace the outline of the leaf on a piece of graph paper. Estimate the surface area by counting how many squares fit inside the outline of the leaf. If you have partial squares, try to add them up to equal whole squares. Record the surface area in the table below. 2. Paint a thin strip of clear fingernail polish a section of the leaf (paint between parallel veins). Allow the fingernail polish to completely dry. 3. Place a piece of clear tape over the dried nail polish. Gently but firmly press the tape onto the leaf. 4. Peel the tape from the leaf and place the tape sticky side down onto a microscope slide. Examine the tape, which now contains an impression of the leaf cells. Try to use both scanning and low power. 5. Count the number of stomata in the field of view. Move the slide so you can see other areas. It may be best to take an average of several areas on the leaf. 6. Find the density of stomata can be measured by dividing the number of stomata by the surface area of the leaf. 1) How does the density of stomata vary amongst different types of plants? 2) How does the density of stomata vary amongst leaf surfaces (upper versus lower surface of leaf)? 3) How does the density of stomata vary among leaves found on the same plant (leaves at the top very leaves at the bottom)? Experimental Design - the procedure for counting stomata and calculating density is described above. Consider the question you chose to investigate, collect data and create a data table to organize your observations. You may want to take photos to include with your final report. Make a Claim that summarizes the answer to your experimental question. Using data from this experiment, provide Evidence that supports the claim. Using background knowledge and data from this lab, provide Reasoning that uses the evidence to justify the claim. For this section you may need to do research outside the class on the type of plant you investigated. Your group will share your data, claim, evidence and reasoning with the class as either a poster, powerpoint slides, or a digital infographic.